Nawaf al Hazmi was one of the five hijackers of American Airlines Flight 77, flown into the Pentagon as the third of the four 9/11 plane hijackings. An al-Qaeda operative with extensive fighting experience, Nawaf al-Hazmi was chosen by Osama bin Laden to serve as second-in-command to 9/11 ringleader Mohamed Atta.National Commission on Terrorist Attacks upon the United States, Thomas H. Kean, and Lee Hamilton. 2004. The 9/11 Commission report: final report of the National Commission on Terrorist Attacks upon the United States. (Washington, D.C.): 242, http://govinfo.library.unt.edu/911/report/911Report.pdf. Nawaf al Hazmi was born on August 9, 1976 in Mecca, Saudi Arabia.“United States v. Zacarias Moussaoui: Criminal No. 01-455-A,” United States District Court Eastern District of Virginia, accessed August 29, 2017, http://www.vaed.uscourts.gov/notablecases/moussaoui/exhibits/prosecution/SD00405.html. His father owned a grocery store in Saudi Arabia, and his family was reportedly wealthy.Jamal Khashoggi and Badr al-Nayyef, “Hijacker list raises more questions,” Arab View, September 22, 2001, http://web.archive.org/web/20020212024004/http://arabview.com/article.asp?artID=98. As a child, Nawaf befriended Khalid al Mihdhar, one of the future 9/11 hijackers.George J. Tenet, “DCI Testimony Before the Joint Inquiry into Terrorist Attacks Against the United States,” Central Intelligence Agency, June 18, 2002, https://www.cia.gov/news-information/speeches-testimony/2002/dci_testimony_06182002.html. By the time of the 9/11 attacks, Nawaf al Hazmi was a veteran jihadist, having trained in al-Qaeda camps in Afghanistan and fought in Bosnia and Chechnya.National Commission on Terrorist Attacks upon the United States, Thomas H. Kean, and Lee Hamilton. 2004. The 9/11 Commission report: final report of the National Commission on Terrorist Attacks upon the United States. (Washington, D.C.): 155, http://govinfo.library.unt.edu/911/report/911Report.pdf. George J. Tenet, “DCI Testimony Before the Joint Inquiry into Terrorist Attacks Against the United States,” Central Intelligence Agency, June 18, 2002, https://www.cia.gov/news-information/speeches-testimony/2002/dci_testimony_06182002.html. In 1997, Hazmi is suspected to have helped smuggle weapons into Saudi Arabia in preparation for a planned terrorism campaign within the Kingdom.Anthony Summers and Robbyn Swan, “The Kingdom and the Towers,” Vanity Fair, June 30, 2011, http://www.vanityfair.com/news/2011/08/9-11-2011-201108. By 1999, Nawaf had already travelled to Afghanistan several times and was involved in the Taliban’s fight against the Northern Alliance.National Commission on Terrorist Attacks upon the United States, Thomas H. Kean, and Lee Hamilton. 2004. The 9/11 Commission report: final report of the National Commission on Terrorist Attacks upon the United States. (Washington, D.C.): 142-155, http://govinfo.library.unt.edu/911/report/911Report.pdf. In Afghanistan, he pledged bay’ah (binding oath of loyalty) to Osama bin Laden and formally became a member of al-Qaeda.George J. Tenet, “DCI Testimony Before the Joint Inquiry into Terrorist Attacks Against the United States,” Central Intelligence Agency, June 18, 2002, https://www.cia.gov/news-information/speeches-testimony/2002/dci_testimony_06182002.html. After Osama bin Laden approved KSM’s plans for the 9/11 operation, he chose Nawaf al-Hazmi to be one of the suicide attackers.National Commission on Terrorist Attacks upon the United States, Thomas H. Kean, and Lee Hamilton. 2004. The 9/11 Commission report: final report of the National Commission on Terrorist Attacks upon the United States. (Washington, D.C.):155, http://govinfo.library.unt.edu/911/report/911Report.pdf. Hazmi received his U.S. visa in April of 1999, far earlier than most of the other hijackers.George J. Tenet, “DCI Testimony Before the Joint Inquiry into Terrorist Attacks Against the United States,” Central Intelligence Agency, June 18, 2002, https://www.cia.gov/news-information/speeches-testimony/2002/dci_testimony_06182002.html. In the fall of 1999, Hazmi, Mindhar, his close childhood friend, and two other al-Qaeda operatives participated in an elite training course at the Mes Aynak camp in Afghanistan.National Commission on Terrorist Attacks upon the United States, Thomas H. Kean, and Lee Hamilton. 2004. The 9/11 Commission report: final report of the National Commission on Terrorist Attacks upon the United States. (Washington, D.C.): 88, http://govinfo.library.unt.edu/911/report/911Report.pdf. The course focused on physical fitness, firearms, close quarters combat, and night operations.National Commission on Terrorist Attacks upon the United States, Thomas H. Kean, and Lee Hamilton. 2004. The 9/11 Commission report: final report of the National Commission on Terrorist Attacks upon the United States. (Washington, D.C.): 88, http://govinfo.library.unt.edu/911/report/911Report.pdf. Upon completing advanced training, Mindhar remained in Afghanistan while the three other trainees went to Karachi, Pakistan, where KSM tried to teach them how to maintain a low profile in the United States.National Commission on Terrorist Attacks upon the United States, Thomas H. Kean, and Lee Hamilton. 2004. The 9/11 Commission report: final report of the National Commission on Terrorist Attacks upon the United States. (Washington, D.C.): 88, http://govinfo.library.unt.edu/911/report/911Report.pdf. The future hijackers learned basic English words and phrases and were taught how to read telephone books, interpret airline timetables, use the Internet, communicate in code, make travel reservations, and rent an apartment.National Commission on Terrorist Attacks upon the United States, Thomas H. Kean, and Lee Hamilton. 2004. The 9/11 Commission report: final report of the National Commission on Terrorist Attacks upon the United States. (Washington, D.C.): 88, http://govinfo.library.unt.edu/911/report/911Report.pdf. Following their training, the three al-Qaeda operatives in Karachi were dispatched to attend an al-Qaeda meeting in Kuala Lumpur, Malaysia.National Commission on Terrorist Attacks upon the United States, Thomas H. Kean, and Lee Hamilton. 2004. The 9/11 Commission report: final report of the National Commission on Terrorist Attacks upon the United States. (Washington, D.C.): 88, http://govinfo.library.unt.edu/911/report/911Report.pdf. In January 2000, Hazmi arrived in Malaysia, staying under the protection of Hambali, then leader of Jemaah Islamiyah.National Commission on Terrorist Attacks upon the United States, Thomas H. Kean, and Lee Hamilton. 2004. The 9/11 Commission report: final report of the National Commission on Terrorist Attacks upon the United States. (Washington, D.C.): 88, http://govinfo.library.unt.edu/911/report/911Report.pdf. Hazmi and other attendees at the meeting discussed plans for 9/11 and the USS Cole bombing.National Commission on Terrorist Attacks upon the United States, Thomas H. Kean, and Lee Hamilton. 2004. The 9/11 Commission report: final report of the National Commission on Terrorist Attacks upon the United States. (Washington, D.C.): 88, http://govinfo.library.unt.edu/911/report/911Report.pdf. In early January of 2000, Hazmi and Mindhar flew to the United States.National Commission on Terrorist Attacks upon the United States, Thomas H. Kean, and Lee Hamilton. 2004. The 9/11 Commission report: final report of the National Commission on Terrorist Attacks upon the United States. (Washington, D.C.): 88, http://govinfo.library.unt.edu/911/report/911Report.pdf. On January 15, 2000, the duo arrived in Los Angeles, becoming the first 9/11 attackers to reach the United States.National Commission on Terrorist Attacks upon the United States, Thomas H. Kean, and Lee Hamilton. 2004. The 9/11 Commission report: final report of the National Commission on Terrorist Attacks upon the United States. (Washington, D.C.): 88, http://govinfo.library.unt.edu/911/report/911Report.pdf. KSM foresaw that Hazmi and Mindhar would have a difficult time maintaining a low profile in the United States. Neither al-Qaeda operative spoke English well nor had they spent any time in the United States.National Commission on Terrorist Attacks upon the United States, Thomas H. Kean, and Lee Hamilton. 2004. The 9/11 Commission report: final report of the National Commission on Terrorist Attacks upon the United States. (Washington, D.C.): 216, http://govinfo.library.unt.edu/911/report/911Report.pdf. As such, KSM instructed the future 9/11 attackers to seek assistance from Muslims at local mosques by posing as newly arrived Saudi students.National Commission on Terrorist Attacks upon the United States, Thomas H. Kean, and Lee Hamilton. 2004. The 9/11 Commission report: final report of the National Commission on Terrorist Attacks upon the United States. (Washington, D.C.): 216, http://govinfo.library.unt.edu/911/report/911Report.pdf. Little is known about Hazmi’s and Mindhar’s first days in the United States. What is known is that the future 9/11 attackers stayed in Los Angeles for roughly two weeks before moving to San Diego.National Commission on Terrorist Attacks upon the United States, Thomas H. Kean, and Lee Hamilton. 2004. The 9/11 Commission report: final report of the National Commission on Terrorist Attacks upon the United States. (Washington, D.C.): 216, http://govinfo.library.unt.edu/911/report/911Report.pdf. During KSM’s C.I.A. interrogation, he claimed that Hamzi and Mindhar tried to enroll in three different English-language schools in Los Angeles.National Commission on Terrorist Attacks upon the United States, Thomas H. Kean, and Lee Hamilton. 2004. The 9/11 Commission report: final report of the National Commission on Terrorist Attacks upon the United States. (Washington, D.C.): 216, http://govinfo.library.unt.edu/911/report/911Report.pdf. While in Southern California, the pair may have received assistance from attendees of the King Fahd Mosque.National Commission on Terrorist Attacks upon the United States, Thomas H. Kean, and Lee Hamilton. 2004. The 9/11 Commission report: final report of the National Commission on Terrorist Attacks upon the United States. (Washington, D.C.): 216, http://govinfo.library.unt.edu/911/report/911Report.pdf. On February 1, 2000, the two met and befriended Omar al-Bayoumi at a halal food restaurant on Venice Boulevard in Culver City, only a few blocks away from the King Fahd mosque.National Commission on Terrorist Attacks upon the United States, Thomas H. Kean, and Lee Hamilton. 2004. The 9/11 Commission report: final report of the National Commission on Terrorist Attacks upon the United States. (Washington, D.C.): 216, http://govinfo.library.unt.edu/911/report/911Report.pdf. Hazmi and Mindhar, posing as Saudi exchange students, told Bayoumi that they were having a hard time living and studying in the United States, did not enjoy living in Los Angeles, and did not know anybody who could help them out.National Commission on Terrorist Attacks upon the United States, Thomas H. Kean, and Lee Hamilton. 2004. The 9/11 Commission report: final report of the National Commission on Terrorist Attacks upon the United States. (Washington, D.C.): 217-218, http://govinfo.library.unt.edu/911/report/911Report.pdf. Bayoumi offered to help the pair settle in San Diego.National Commission on Terrorist Attacks upon the United States, Thomas H. Kean, and Lee Hamilton. 2004. The 9/11 Commission report: final report of the National Commission on Terrorist Attacks upon the United States. (Washington, D.C.): 217-218, http://govinfo.library.unt.edu/911/report/911Report.pdf. By February 4, Hazmi and Mindhar travelled to San Diego from Los Angeles and sought out Bayoumi, who helped them find an apartment, co-sign their lease at the Clairemont Parkwood Apartments, and open up a bank account.Maureen Cavanaugh and Megan Burke, “Retracing the Story: 9/11 Hijackers in San Diego,” KPBS, September 6, 2011, http://www.kpbs.org/news/2011/sep/06/retracing-story-911-hijackers-san-diego/. However, Hazmi soon began to suspect that Bayoumi might be a Saudi spy, so the duo filed a 30-day notice of intention to vacate the apartment only a week after moving in.National Commission on Terrorist Attacks upon the United States, Thomas H. Kean, and Lee Hamilton. 2004. The 9/11 Commission report: final report of the National Commission on Terrorist Attacks upon the United States. (Washington, D.C.): 219, http://govinfo.library.unt.edu/911/report/911Report.pdf. On May 10, the two al-Qaeda operatives decided to rent a room in the residence of an FBI informant whom they had met at a mosque in San Diego.National Commission on Terrorist Attacks upon the United States, Thomas H. Kean, and Lee Hamilton. 2004. The 9/11 Commission report: final report of the National Commission on Terrorist Attacks upon the United States. (Washington, D.C.): 220, http://govinfo.library.unt.edu/911/report/911Report.pdf. The FBI asset knew the future 9/11 hijackers were devout Muslims but did not suspect that they held extremist views or were linked to any terrorist groups.National Commission on Terrorist Attacks upon the United States, Thomas H. Kean, and Lee Hamilton. 2004. The 9/11 Commission report: final report of the National Commission on Terrorist Attacks upon the United States. (Washington, D.C.): 220-221, http://govinfo.library.unt.edu/911/report/911Report.pdf. While residing in San Diego in 2000, Hazmi and Midhar did not reportedly stand out. The two did not attempt to conceal their identities, using the same names contained in their travel documents when they rented an apartment, obtained drivers’ licenses, opened bank accounts, took out credit cards, purchased a used car, and obtained a local phone service that included al-Hazmi’s listing in the local telephone directory.National Commission on Terrorist Attacks upon the United States, Thomas H. Kean, and Lee Hamilton. 2004. The 9/11 Commission report: final report of the National Commission on Terrorist Attacks upon the United States. (Washington, D.C.): 221, http://govinfo.library.unt.edu/911/report/911Report.pdf. Posing as new foreign students wishing to learn English, the two reached out to members of the local Muslim community for help.National Commission on Terrorist Attacks upon the United States, Thomas H. Kean, and Lee Hamilton. 2004. The 9/11 Commission report: final report of the National Commission on Terrorist Attacks upon the United States. (Washington, D.C.): 220, http://govinfo.library.unt.edu/911/report/911Report.pdf. In May of 2000, Nawaf and Khalid started flight lessons, but they had to abandon their classes because of poor English-language and technical skills.George J. Tenet, “DCI Testimony Before the Joint Inquiry into Terrorist Attacks Against the United States,” Central Intelligence Agency, June 18, 2002, https://www.cia.gov/news-information/speeches-testimony/2002/dci_testimony_06182002.html. While in San Diego, Nawaf and Khalid notably attended the al-Ribat al-Islami mosque in La Mesa, California, where they met the charismatic preacher Anwar al-Awlaki.J.M. Berger, “Anwar al-Awlaki’s Links to the September 11 Hijackers,” Atlantic, September 9, 2011, https://www.theatlantic.com/international/archive/2011/09/anwar-al-awlakis-links-to-the-september-11-hijackers/244796/. Nawaf referred to Awlaki as a “great man” and apparently considered Awlaki his spiritual leader.J.M. Berger, “Anwar al-Awlaki’s Links to the September 11 Hijackers,” Atlantic, September 9, 2011, https://www.theatlantic.com/international/archive/2011/09/anwar-al-awlakis-links-to-the-september-11-hijackers/244796/. Hazmi remained in the San Diego area before moving to Phoenix where he lived with Hani Hanjour, another 9/11 hijacker.National Commission on Terrorist Attacks upon the United States, Thomas H. Kean, and Lee Hamilton. 2004. The 9/11 Commission report: final report of the National Commission on Terrorist Attacks upon the United States. (Washington, D.C.): 218, http://govinfo.library.unt.edu/911/report/911Report.pdf. At the end of March 2001, Hazmi and Hanjour left their apartment in Phoenix, reaching Falls Church, Virginia on April 4, 2001.National Commission on Terrorist Attacks upon the United States, Thomas H. Kean, and Lee Hamilton. 2004. The 9/11 Commission report: final report of the National Commission on Terrorist Attacks upon the United States. (Washington, D.C.): 227, http://govinfo.library.unt.edu/911/report/911Report.pdf. While there, the two attended the Dar al-Hijra mosque, where Awlaki had moved to serve as one of the imams.National Commission on Terrorist Attacks upon the United States, Thomas H. Kean, and Lee Hamilton. 2004. The 9/11 Commission report: final report of the National Commission on Terrorist Attacks upon the United States. (Washington, D.C.): 517, http://govinfo.library.unt.edu/911/report/911Report.pdf. Hazmi and Atta attempted to meet up in Virginia in early April but were unable to coordinate the meeting.National Commission on Terrorist Attacks upon the United States, Thomas H. Kean, and Lee Hamilton. 2004. The 9/11 Commission report: final report of the National Commission on Terrorist Attacks upon the United States. (Washington, D.C.): 231, http://govinfo.library.unt.edu/911/report/911Report.pdf. In Virginia, Hazmi and Hanjour met another individual, Eyad al-Rababah, who helped them find an apartment to rent.National Commission on Terrorist Attacks upon the United States, Thomas H. Kean, and Lee Hamilton. 2004. The 9/11 Commission report: final report of the National Commission on Terrorist Attacks upon the United States. (Washington, D.C.): 230-231, http://govinfo.library.unt.edu/911/report/911Report.pdf. Rabbah recommended that the pair move to Patterson, New Jersey, an area with a sizable Arabic-speaking community.National Commission on Terrorist Attacks upon the United States, Thomas H. Kean, and Lee Hamilton. 2004. The 9/11 Commission report: final report of the National Commission on Terrorist Attacks upon the United States. (Washington, D.C.): 230, http://govinfo.library.unt.edu/911/report/911Report.pdf. On May 8, Rababah went to Hazmi and Hanjour’s apartment to pick them up for a trip to look for a place to live in Connecticut and found the duo with two new roommates, future 9/11 hijackers Ahmed al Ghamdi and Majed Moqed. After a short stay in Connecticut, Rababah drove the four to Paterson and showed them around before returning to Virginia.National Commission on Terrorist Attacks upon the United States, Thomas H. Kean, and Lee Hamilton. 2004. The 9/11 Commission report: final report of the National Commission on Terrorist Attacks upon the United States. (Washington, D.C.): 230, http://govinfo.library.unt.edu/911/report/911Report.pdf. Within a few weeks, Hanjour, Hazmi, and four other 9/11 operatives, Salem al Hazmi, Ahmed al Ghamdi, Khalid al Mihdhar, and Abdul Aziz al Omari, moved into an apartment in Patterson, New Jersey.National Commission on Terrorist Attacks upon the United States, Thomas H. Kean, and Lee Hamilton. 2004. The 9/11 Commission report: final report of the National Commission on Terrorist Attacks upon the United States. (Washington, D.C.): 230, http://govinfo.library.unt.edu/911/report/911Report.pdf. There, Hazmi’s behavior mirrored that of the other 9/11 hijackers.National Commission on Terrorist Attacks upon the United States, Thomas H. Kean, and Lee Hamilton. 2004. The 9/11 Commission report: final report of the National Commission on Terrorist Attacks upon the United States. (Washington, D.C.): 242, http://govinfo.library.unt.edu/911/report/911Report.pdf. He opened new bank accounts, acquired a mailbox, rented cars, and started working out with his roommates. Hazmi remained in New Jersey until a few weeks before September of 2001.National Commission on Terrorist Attacks upon the United States, Thomas H. Kean, and Lee Hamilton. 2004. The 9/11 Commission report: final report of the National Commission on Terrorist Attacks upon the United States. (Washington, D.C.): 242, http://govinfo.library.unt.edu/911/report/911Report.pdf. Hazmi and 9/11 ringleader Atta first crossed paths in the United States sometime between June 19 and June 25, when Hazmi travelled round-trip from Newark to Miami.National Commission on Terrorist Attacks upon the United States, Thomas H. Kean, and Lee Hamilton. 2004. The 9/11 Commission report: final report of the National Commission on Terrorist Attacks upon the United States. (Washington, D.C.): 242-243, http://govinfo.library.unt.edu/911/report/911Report.pdf. It is suspected that the pair met on a monthly basis between late June and August to finalize their attack preparations.National Commission on Terrorist Attacks upon the United States, Thomas H. Kean, and Lee Hamilton. 2004. The 9/11 Commission report: final report of the National Commission on Terrorist Attacks upon the United States. (Washington, D.C.): 242-243, http://govinfo.library.unt.edu/911/report/911Report.pdf. In the days before 9/11, Salem al Hazmi, his brother, and the other hijackers targeting American Airlines Flight 77 travelled from New Jersey to Laurel, Maryland, staying in a local motel and working out at the gym in preparation for the attacks.National Commission on Terrorist Attacks upon the United States, Thomas H. Kean, and Lee Hamilton. 2004. The 9/11 Commission report: final report of the National Commission on Terrorist Attacks upon the United States. (Washington, D.C.): 252, http://govinfo.library.unt.edu/911/report/911Report.pdf. On the final night before the attack, the team stayed at a hotel in Herndon, Virginia, near Washington Dulles airport.National Commission on Terrorist Attacks upon the United States, Thomas H. Kean, and Lee Hamilton. 2004. The 9/11 Commission report: final report of the National Commission on Terrorist Attacks upon the United States. (Washington, D.C.): 253, http://govinfo.library.unt.edu/911/report/911Report.pdf. On the morning of September 11, Hazmi and his team travelled to Washington Dulles International Airport.National Commission on Terrorist Attacks upon the United States, Thomas H. Kean, and Lee Hamilton. 2004. The 9/11 Commission report: final report of the National Commission on Terrorist Attacks upon the United States. (Washington, D.C.): 3, http://govinfo.library.unt.edu/911/report/911Report.pdf. At around 7:30 a.m., Hazmi, his brother, and Hani Hanjour approached the American Airlines ticket counter for Flight 77, bound for Los Angeles.National Commission on Terrorist Attacks upon the United States, Thomas H. Kean, and Lee Hamilton. 2004. The 9/11 Commission report: final report of the National Commission on Terrorist Attacks upon the United States. (Washington, D.C.): 3, http://govinfo.library.unt.edu/911/report/911Report.pdf. The Hazmi brothers were flagged for extra screening but managed to make it through security.National Commission on Terrorist Attacks upon the United States, Thomas H. Kean, and Lee Hamilton. 2004. The 9/11 Commission report: final report of the National Commission on Terrorist Attacks upon the United States. (Washington, D.C.): 3, http://govinfo.library.unt.edu/911/report/911Report.pdf. Once aboard the plane, the Hazmi brothers took their seats in the first-class cabin.National Commission on Terrorist Attacks upon the United States, Thomas H. Kean, and Lee Hamilton. 2004. The 9/11 Commission report: final report of the National Commission on Terrorist Attacks upon the United States. (Washington, D.C.): 3, http://govinfo.library.unt.edu/911/report/911Report.pdf. At 9:37 a.m., American Airlines Flight 77 crashed into the Pentagon at approximately 530 miles per hour, instantly killing everyone on board and an unknown number of people in the building.National Commission on Terrorist Attacks upon the United States, Thomas H. Kean, and Lee Hamilton. 2004. The 9/11 Commission report: final report of the National Commission on Terrorist Attacks upon the United States. (Washington, D.C.): 10, http://govinfo.library.unt.edu/911/report/911Report.pdf. The 9/11 attacks—including attacks on the World Trade Center, the Pentagon, and the thwarted attack headed for the White House or Capitol—left nearly 3,000 people dead in the single deadliest attack in U.S. history.National Commission on Terrorist Attacks upon the United States, Thomas H. Kean, and Lee Hamilton. 2004. The 9/11 Commission report: final report of the National Commission on Terrorist Attacks upon the United States. (Washington, D.C.): 7, http://govinfo.library.unt.edu/911/report/911Report.pdf. 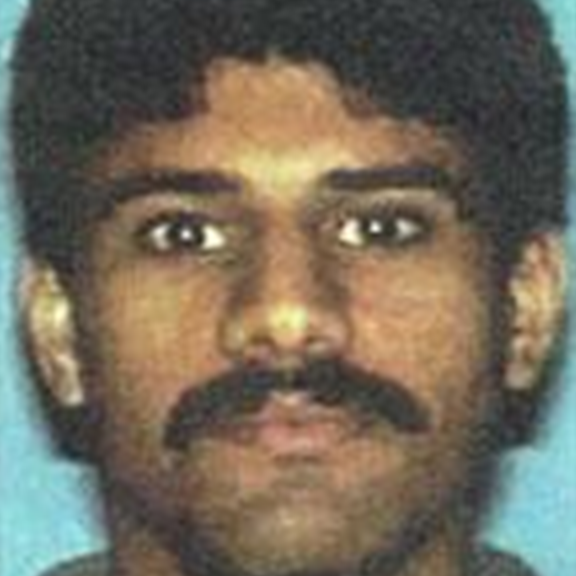 Nawaf al Hazmi was one of the five hijackers of American Airlines Flight 77, flown into the Pentagon as the third of the four 9/11 plane hijackings.